Profiteroles sound complicated, but they're really easy, especially when you employ the mixer for beating in the eggs. To make the dough, you simply bring some water, butter, and salt to a boil; stir flour into the mixture to form a dough; transfer the dough to the mixer; and beat in the eggs. For added flavor, I stirred some shredded mozzarella into the dough. You can definitely spoon the dough onto the baking sheets, but I find piping a little more efficient and uniform, so I scooped the dough into my piping bag and piped little quarter-size circles of dough. After baking, the dough was nicely puffed and golden brown, and I had tiny profiteroles just waiting for a fun filling. I'm still getting tons of tomatoes from my garden, from Sun Golds to Sweet 100s, so I used these for a flavor-packed summer-y filling. I cut the tomatoes into small pieces, mixed them with basil, tossed the mixture with olive oil and balsamic vinegar, and adjusted the seasoning with some salt and pepper. Then I sliced the tops of the profiteroles, cutting almost all the way though, but leaving them attached at one side. I spooned the tomato mixture into each one, sandwiching it inside, and then I set the profiteroles out on a platter. These cheesy puffs were party-ready in no time. If you're looking for ways to hang on to summer, I suggest making these with all the mini tomatoes you can still get your hands on from your garden or at your local farmers' market. 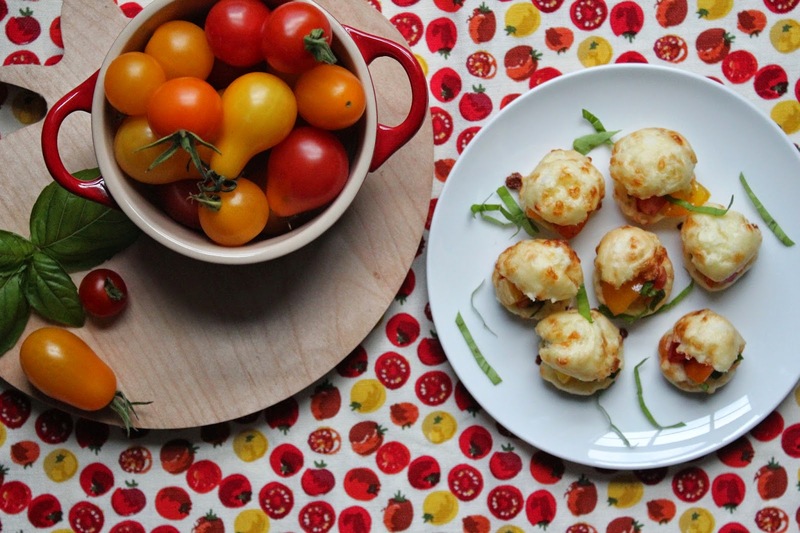 make a perfect summer hors d'oeuvre. Preheat oven to 375 degrees and line 2 baking sheets with Silpats or parchment paper. Combine water, butter, and 1/2 teaspoon kosher salt in medium saucepan over medium heat. Bring to a boil, remove from heat, and stir in flour using wooden spoon. Stir vigorously until a ball forms, about 15 seconds. Continue to cook 1 minute longer, stirring constantly. Transfer dough to bowl of stand mixer fitted with paddle. Beat on medium speed to cool dough, about 2 minutes. Add eggs, one at a time, scraping down bowl as needed and beating until fully incorporated. Stir in mozzarella. Transfer half of dough to piping bag fitted with round tip. Pipe quarter-size circles of dough about 1 inch apart on prepared baking sheets. Pat down any peaks with wet fingertip. Lightly sprinkle tops of dough circles with sea salt. Bake, 1 sheet at a time, until puffed and golden brown, rotating sheet halfway through baking, 18 to 20 minutes. Let profiteroles cool on sheets for 5 minutes, then transfer to wire rack to cool completely. Repeat with any remaining dough. While profiteroles are baking, combine tomatoes and basil in medium bowl. Drizzle lightly with olive oil and balsamic, and season with salt and pepper to taste. Do you want summer to linger, or are you ready for fall? This post contains an affiliate link to a cookbook I like. If you follow the link to purchase the cookbook or make other purchases, I'll earn a few cents.